SEATTLE – Mike Hopkins is frantically scrolling through the photo album on his phone. Stored deep in the collection of screen shots, aerial images from his many plane trips and family pictures is an image that helps define what he’s trying to build in his first season as Washington’s head coach. It’s a picture of a quote. And it has a connection to his favorite band, Pearl Jam. “When you trust people that you work with and let them have their freedom, that’s when the chemistry happens. That’s when the real art goes down,” Hopkins reads, looking at the photo of a quote attributed to Pearl Jam bassist Jeff Ament. Building chemistry. Forming the foundation. Those are the underlying principles of what Hopkins has done in the 10 months since he left all he knew at Syracuse for the chance to turn around the Huskies’ program. It’s one of the most surprising stories in college basketball. The Huskies are 15-6 overall and 5-3 in Pac-12 play with a huge week coming up against No. 25 Arizona State and No. 9 Arizona that will go a long way in determining Washington’s NCAA Tournament hopes. 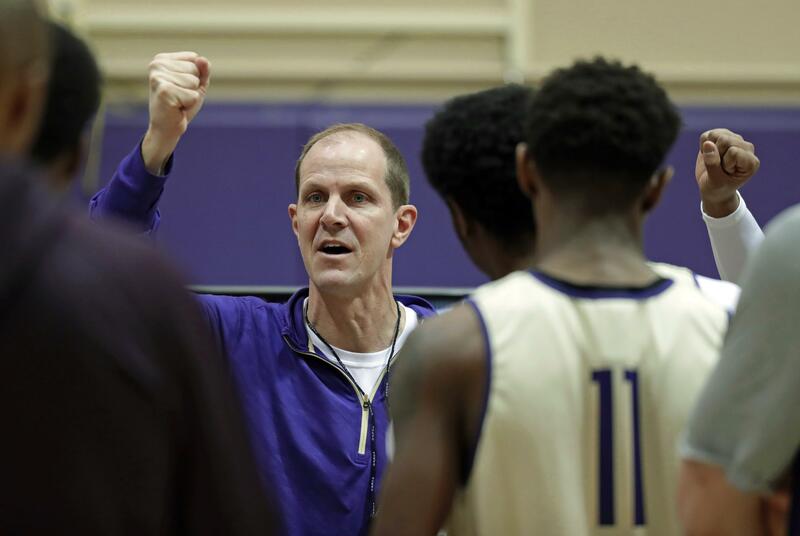 Any talk about the NCAAs seemed ridiculous when the Huskies gathered for their first practice in the fall. Now it’s a realistic goal entering February. The Associated Press was given an inside look at the Huskies last week as they prepared for their matchup with rival Washington State. What stands out most about Hopkins’ first season is how the narrative has changed. Six months ago, most were wondering why Hopkins left Syracuse as the coach-in-waiting behind Jim Boeheim. Now, the story has become about the foundation Hopkins has created and where might the Huskies go from here. Before every home practice, the signs are affixed to a wall or railing. They are foundational pillars for Hopkins’ program. They are not subject to debate. There are more than a dozen in all, placed at each end of the floor. The last may be the most important to Hopkins. This is a program that’s endured its lumps in recent seasons, going from a perennial Pac-12 contender to missing the NCAAs for six consecutive seasons. Hopkins had to win over his players upon his arrival, recruiting them to stay then proving what he was selling works. On this day, it means running practice in an entirely different way. Hopkins puts 60 minutes on the clock. It will continue to tick away, but errors or lack of effort will add time. One of Hopkins’ assistants came up with the idea. Generally, Washington practices aren’t long – 75 to 120 minutes depending on the day – but this was a new take. Hopkins finds a few flaws and time is added. When freshman Michael Carter III fails to run the correct set, 5 minutes are added. Hopkins voices his displeasure, but stops to instruct Carter and leaves him with a high-five. It’s one of the few times Hopkins inserts himself into practice. He lets his assistants – Dave Rice, Cameron Dollar and Will Conroy – coach. There’s no micromanaging. Ninety minutes before tip-off, Hopkins invites the broadcast crew into his office. It’s a relaxed environment in a room that is decidedly bland. The only items hanging on the walls are a giant purple “W” behind his desk and the TV tuned into one of the dozens of games being broadcast this day. If this seems abnormal, it is. Washington has done away with game-day shootaround. Hopkins values rest over having players going to the arena, getting geared up and going through a simulated practice only to do that again to get ready for the game. The team meets for film and a meal the night before games, but doesn’t reconvene until the pregame meal a few hours before tip. At least his second cup of Starbucks sits on his desk with ‘Hop’ written in black ink. This crew hasn’t done a Washington game yet this season, so much of the session is Hopkins describing his strategy, the implementation of that system and ultimately why the Huskies are in the Pac-12 race. Hopkins is himself: laughing, gregarious, honest. He points to wins over Kansas and Southern California on the road as validating moments, but notes the Huskies have faltered after those big wins. A sign of growth would be beating the Washington State Cougars after last week’s road win at Colorado. Two mint candies sit on the scorer’s table at all times. Spearmint, to be exact. If one gets taken, it’s immediately replaced. Occasionally, a different hard candy will be grabbed by Hopkins or a member of his staff, but it’s almost always a mint. For two hours, Hopkins will cycle through his stash of mints while directing the Huskies to a convincing 80-62 win over their rivals from Washington State. There have been times this season when Hopkins has needed to yell at his players. This night is not one of them. The only time he screams is when he’s raining praise in a timeout huddle after two perfect possessions of ball rotation on offense led to open shots. They were part of an 18-2 run Washington used to close the first half. After Noah Dickerson’s dunk to give Washington a 31-28 lead, Hopkins turns to the Huskies student section and yells, “Let’s go,” asking for more noise, knowing the Cougars are rattled. The student section was once named after former coach Lorenzo Romar. It may be named after Hopkins soon enough. His evening ends with him summoning walk-ons off the bench. He takes note that three of Washington State’s six 3-pointers came in the final minutes with reserves in the game. He finds a moment after he finishes his postgame radio duties to shake hands with a fan wearing a Syracuse hat. Published: Jan. 31, 2018, 5:08 p.m.